My Favorite Short of the Season, along with Wakaba Girl! Hmmmm, so it's basically one of those 'generic' "Cute Girls doing Cute things" type of Anime. As explained above, it's a Short...3 minutes or so long, but with a good Minute long or so OP. Overall, it's DEFINITELY not going to be a waste of Your Time by paying mind to watching this Show at Your leisure. And plus, Hakone is just super kawaiii...How else can one be blown away? 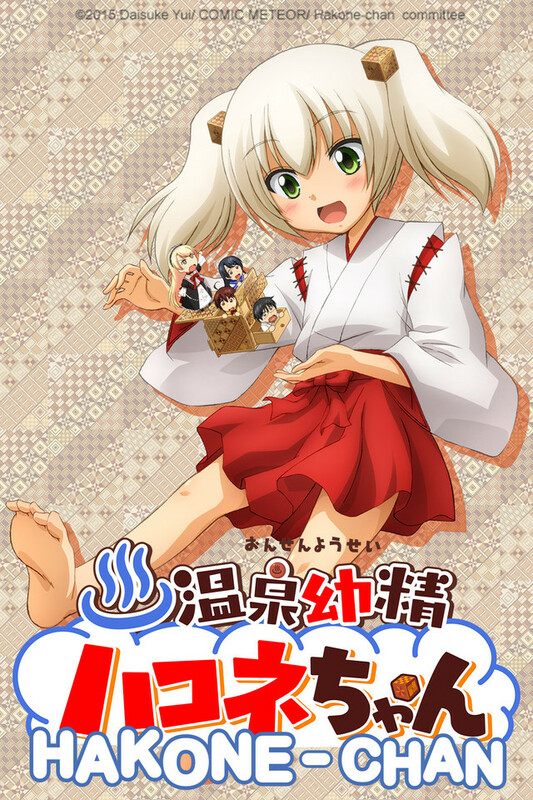 So again, 3 minutes out of Your Life isn't much to miss out on for those Who end up deciding to watch the Spirit of the Onsen, which means "Hot Springs"...Hakone-chan! Episode 1 First Reaction EDITED! FULL REVIEW! This is one of those short shows that is about 3 and a half minutes long so it doesn't have much time for much actual plot. The comedy in this is pretty decent and the art and animation is pretty mediocre. The OP (I don't get why there should be one in a 3 and a half minute show) takes up about 1/8th (30 seconds of a 210 second show) of the episode so looking for character development may be hard. I can't even fully recognize the story here, but I'm guessing it's just going to be random situations with the spirit of this well. Overall, this is just a show to kill time if you have a couple minutes and may give you a laugh or two. Its art and animation are pretty good and the characters seem like they work well together. This is nothing spectacular so, for the time being, I give this show a 3/5! I give this series a 2/5. I don't think this series is worth your time. Character's personalities are wishy-washy as well as their relationships. It uses tons of cliches. There is no attachment to the characters whatsoever. This show seems like it was supposed to have full length episodes, but since it didn't it leaves its audience with a half baked ending that isn't fulfilling at all. I've seen more character development in 10 minutes before compared to the 39 minutes this show has. It also tries to have a continuous storyline by picking up where previous episodes left off furthering the assertion I stated that this show was supposed to have longer episodes, but falls flat as wastes too much time to get started and tries to conclude everything in the last 1 minute of the show. While Hakone-chan is not the stand out of animes, or short animes for that matter, it is definitely fun to watch. Besides a colorful cast of cute characters, it is quite funny, though some of the jokes are cliche. The art could be better also, but if you are just looking for a quick laugh and just entertaining short, I highly recommend Hakone-chan!